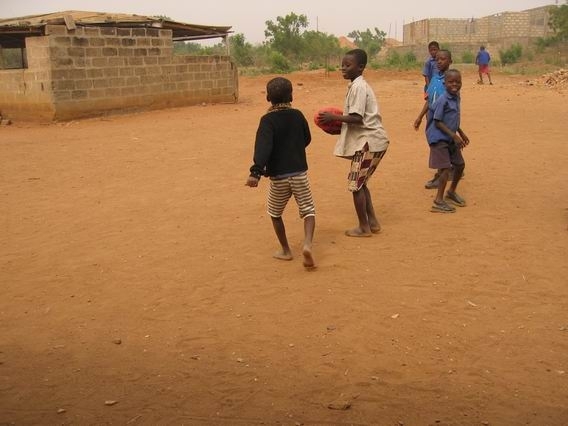 While it may not be strange to find kids kicking a football in Ghana (a soccer powerhouse where the round ball game takes on an almost religious fanaticism) it would seem strange to see the Australian football being kicked around. At least in Dawhenya, a rural town just east of the Ghanian capital Accra, the local children are keen to try it. WFN recently interviewed Tim Foster, a Melbourne University student who travelled to Africa to teach at a local primary school in early 2005. He has returned on multiple occasions and has introduced many of the local kids to all things Australian, including (by virtue of his junior playing years and participation in the VAFA) - Australian rules football. "I brought over a few of those soft rubbery footies, and the kids loved it." says Foster. "An Australian couple had taught at the same school only a few months before me so they already had a few Bunnings warehouse footies lying around the school storeroom. 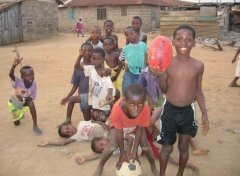 Some of the kids could kick really well, no doubt due to their soccer background". Surprisingly, the local children are quite aware of Australia. "Probably the two recent events that have put Australia on the map from the perpective of a Ghanaian have been the soccer friendly between Ghana and Australia in November 2006, and the fight(s) between Jeff Fenech and Azumah Nelson (who is a national hero in Ghana)", says Foster. As a result, the children are enthusiastic about Australia and enthusiastic about exchanging culture, according to Tim "a lot of the kids could name more cities in Australia than in Ghana. The local children are familiar with Australian native animals - koalas and kangaroos. At the local school they fly an Australian flag next to the Ghanaian one". The Australian High Commission in Accra funds a number of local infrastructure developments through Australian Department of Foreign Affairs and Trade and more recently AusAID allocations. The school in Dawhenya also received funding from Trininty College and Rotary club of Oakleigh. Tim has been involved in some of these projects. While to his knowledge there has been no organised matches played and no detailed accounts of the rules have been conveyed, Tim says "the kids loved kicking it around and went bananas as the ball would bounce in all different directions, which was a real novelty for them. Handballing was the most foreign aspect and the one which was the most difficult to teach." 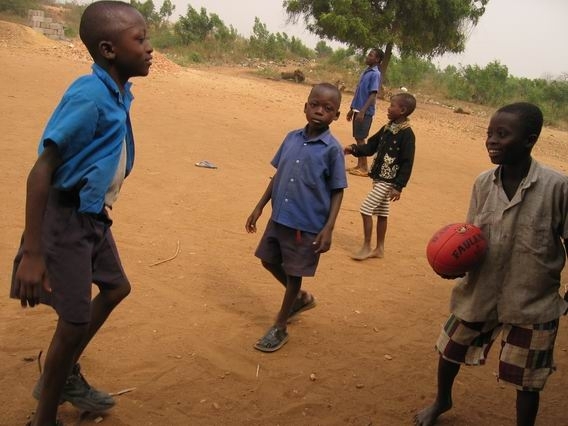 Most of the kick-to-kick type activities take place informally during or after school times. When asked about the potential for footy to be played in Ghana like the leagues in South Africa, Foster is realistic about the challenges the Australian game would face there "Who knows - though it would be difficult to compete with the fervent passion most Ghanaians hold for soccer ... having said that, more than a few locals are perfectly built to break a (Aussie Rules) game apart from centre half forward". The first choice of sport in Ghana is certainly soccer, the country is currently the second highest ranking African country in FIFA and has recently set the pace in terms of sheer junior world rankings and participation. In contrast, rugby football has little presence at all in the country, giving plenty of opportunity for the bigger, stronger kids to play other sports. The extraordinary growth in South Africa has shown that with a little assistance Australian rules football can fill a niche even in soccer and rugby dominated regions. Clinics held in Kenya and the excitement of Ghanaian kids about Australia and the novelty of footy may make developing nations in North and West Africa a prospect for small junior leagues in future, especially if the Australian funds can be extended to sport as is the case in South Africa where the Australian dollar stretches much further than footy programs in countries such as the USA, New Zealand or Canada. Although Tim has no plans to return to Ghana in the near future, he knows Australians working there and has friends planning a trip at the end of this year. WFN hopes to hear more from the young Ghanians and as they learn more about our country and our indigenous game, we will follow this story more closely. You can read more about Tim's experience in Ghana in this great article from the Trinity College (University of Melbourne) website. Thanks to Tim Foster for the interview and the photos used with permission.